Gum disease is one of the most dangerous oral health conditions because it presents a slippery slope. Gingivitis is an early stage of gum disease, characterized by inflammation and swelling around the gum line. You may feel chronic discomfort and see acute redness around areas of your gum line. While this condition can be annoying and painful, it’s only the beginning of your problems. Untreated gingivitis can eventually lead to periodontitis. This condition is irreversible and means a lifetime of management. Left unchecked, periodontitis leads to a deterioration of the jaw bone, and eventually, tooth loss. How Do You Develop Gum Disease Initially? The best way to avoid the problems that come with gingivitis is by stifling gum disease entirely. You may develop gum disease the same way you would develop a cavity. The bacterial film (plaque) that develops on the surfaces of your teeth can aggregate around your gum line. When the bacteria congregate beneath your gums, the infection develops and the inflammation begins to show up. Brushing and flossing around your gum line are vital practices that help you prevent gum disease from developing. If you do develop gingivitis (or you need to manage your periodontitis), you have a treatment option to help. Scaling and root planing allows your dentist to access the area beneath the gum line and remove bacteria buildup. 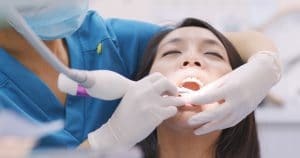 Your dentist will then smooth out the surfaces of your tooth roots (planing), which have likely suffered some degree of decay from the bacteria. While avoiding gum disease altogether is preferrable, know that the fight is not lost when you develop gingivitis. If you have noticed inflammation around your gum line, you should seek help from a dentist as soon as possible. Regular checkups also allow your dentist to check for issues like gingivitis. Dr. Roberts and the Greenhaven team provide scaling and root planing treatment to help fight off gum disease and keep your mouth healthy. To schedule an appointment, contact Greenhaven Family Dental in Baxter, MN at 218-454-0523.